High Five is not a bubble team this year; they are a legitimate Great Lakes title contender. It was the best of times and the even better of times for two teams of the Midwest. Since the club region redraw four years ago, the Great Lakes Regional tournament has been a tournament of one true elite team. Chicago Machine has had a stranglehold on the title since the lines were redivided, and while there has been two to three teams from the region that have at times received national recognition, they, along with the dozens of scrappy Tier II teams and incredible parity below that, have been out of Machine’s class. Even two years ago, when High Five, in their inaugural season of 2013, earned a strength bid (which Madcow later stole to take to Nationals), Chicago has been largely unthreatened. That has now officially changed. Consider the Great Lakes a region of two elite teams, thanks to High Five’s new power look, filled with Madcow and Bro Cats veterans in a semi-merger. The East Plains joins the Central Plains with a strong squad of its own and brings a strength bid with it for the first time in two years. Even more than that, High Five brings the number three spot in the final regular club season rankings, an admirable and rarely achieved level of status that is more than just a boost to their confidence. The squad from Michigan has a powerful defensive intensity; they have done an admirable job of taking stars of shallower ponds and turning them into an unselfish, hard-working group that fills smaller roles, with smaller jobs, to greater effect. High Five will have no trouble making Nationals this year. Indeed, this team looks for a chance to be the first team outside of Chicago to claim the Great Lakes Regional title and to truly cement their status as an elite squad and National-level contender. And even if that dream fails, they’ll have a very comfortable time fighting off any pressure from the second-bid below. Machine is still the odds-on favorite of the experts, rankings or no, but the Great Lakes is finally a region to keep an eye on, rather than just scroll past affirmation of a predetermined winner. Let’s break down each of the two top dogs, and glance at the parity below, to preview what should be an interesting tournament and a dynamite championship game. Machine last lost a regional title in 2011, back when Minnesota and Wisconsin were in their same central region. Since then, they have been the undisputed contender of the Great Lakes and one of the more dominant teams in the Midwest. 2015 has seen another very solid regular season (they are only one spot behind High Five at number four in the final rankings), but they’ve largely avoided the hype this year, as the collapse at last year’s National Championships continues to haunt their reputation. Machine, although losing the Madison Club crossovers from last season, has kept the majority of their core pieces, including the dominant athletic cutters A.J. Nelson, Kevin Kelly, Cullen Geppert, and Jonathan Helton. Along with a bevy of other skilled role players, as well as talented handlers Walden Nelson, Bob Liu, and the throwing wizard Brett Matzuka (new to the team after a season with the AUDL’s Chicago Wildfire), this squad has a deep and talented roster. Machine has success through a fast-attacking offense, largely built off cutter-to-cutter connections, and tight, athletic defense. Led by their captains and veteran player-coach Ron Kubalanza, the team has a strong game plan for every match. But neither the strategy nor the skills of Machine have ever been in question. Instead, it is the mental game that has been Chicago’s bane for the past few seasons, as they have been unable to breakthrough to semifinals at Nationals. That mental toughness will be put to the test earlier this year, as the Regional title is by no means a sure thing. High Five had a crushing victory over Machine in the finals of the Elite Select Challenge and will undoubtedly give them a hard fought match (if not hand them a defeat) in the postseason. But this could actually prove to be an advantage for Chicago. With two bids on the line, it’s unlikely they’ll feel pressure over making Nationals; their pride will push them to treat the finals like a do-or-die game. If they can find that mental grit and toughness, something that High Five, a scrappier and less experienced team has already proven to have, Chicago Machine will be a force to be reckoned with. High Five has gone all in, proving it in a variety of ways. Jonny Bansfield and James Highsmith gave up their final season of college eligibility to captain this team, the leaders recruited across the section, and pulled together the top players of Madcow and Bro Cats to create a powerful team that can only be called elite. Number three in the entire country fills that definition by any possible measure; they take the top bid and are numerically the favorite, even if they lack the veteran experience that makes Machine the Vegas favorite. Their win over Machine earlier this year featured all their best attributes: stifling, athletic defense and unselfish, fast-paced, and thrower-driven offense, and there’s absolutely no reason to think they can’t win against Chicago again. Even more recently, at the Pro Flight Finale, High Five had a phenomenal tournament, going 5-1 against the best in the nation. Suddenly people are thinking of them as a possible semis contender. But the windy conditions certainly played a role in that weekend (and may do so in future events). At this point, as high as the ceiling may be, the consistency is what will be called into question. Veteran additions such as Phil Cherosky will help, as will the sheer talent found in a player like Mitch Cihon. With the increase of depth from the merger, High Five is able to use their stars more effectively by having each player focus on their role and save their energy for the key moments. Many of the Michigan players, like Highsmith, are able to anchor the defensive line, largely because the Ohio contingent is able to create a veteran offensive line with skilled throwers throughout. High Five honestly has the pieces to compete at the highest level, especially with a depth that will let them ensure their stars are ready for the big game. Below the top two, there is simply limitless parity in this region across the board. None of these teams will be effectively able to challenge for the second bid, but instead it will be a fight of pride, honor, and regional standing to determine who gets to play in that game-to-go. Cleveland Smokestack is the team who has received the most benefits from the dissolution of Mad Cow. Smokestack, formerly Lake Effect, runs with some savvy veterans and a slow and steady O-line. A smart team that can bring the fire, they were the second best of the East Plains this season, followed by the solidly growing Kentucky Flying Circus. Black Market captured the Central Plains Sectional title for the second year in a row, and sent a B team to Regionals this year, proving that the team from the Chicago suburbs has depth and talent. Last year, Black Market put a scare into Madcow at the Regional tournament and at their best, they’ll likely threaten and force the second place team (tired after the finals) to work hard in the game to go. 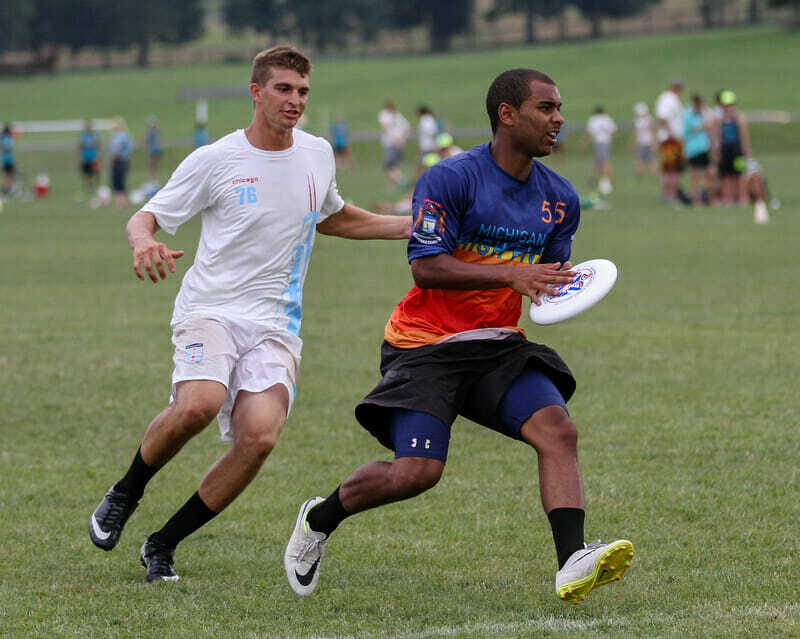 Brickyard of Indiana snagged the second spot at the Central Plains, and has also been growing steadily in ability over the last few years and has a huck and gun style, reminiscent of the attitude, and full of the stars of, the Indianapolis AlleyCats. When they’re clicking, they have the panache to challenge anyone, but they can also make mistakes that will cost them. The other Chicago teams led by Beachfront Property’s speed and Haymaker’s line of savvy veterans can easily battle for the top five when they’re playing well. Still, despite it all, Machine and High Five, while having to put forth effort to put down the second tier teams, will not be seriously hindered. The tickets to Nationals are as good as punched with Madcow’s dissolution, but the question of who gets first-class is yet to be decided. Comments on "A Tale Of Two Teams: 2015 Great Lakes Men’s Regionals Preview"